Russia and India are looking to give a thrust to joint manufacturing in hi-tech areas such as automobile, industrial and road-building machinery, chemical and petrochemical industry and civil aircraft construction. 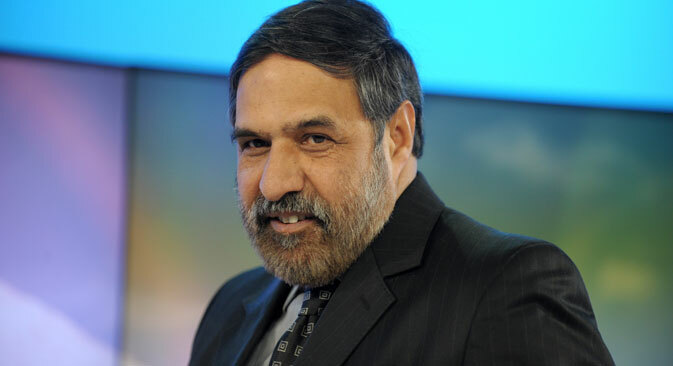 Delegations led by India’s Commerce and Industry Minister Anand Sharma and Russian Deputy Prime Minister Dmitry Rogozin identified core areas to boost bilateral trade at the 7th meeting of India-Russia Trade and Investment Forum, which was held on Friday, September 20 in St Petersburg. The multi-sectoral delegations from the two countries, led by Sharma and Rogozin, especially focussed on trade, investment, service sector, pharmaceuticals, tourism, including medical tourism, gems and jewellery, engineering goods, manufacturing, agriculture and food processing, fertilizer, IT, chemicals, automobiles and oil and gas. The forum also provided opportunities between the two sides for business to business meetings, two facilitate better understanding among the business community of the two countries. A statement issued after the forum mentioned that in a renewed thrust to joint manufacturing in hi-tech areas, India and Russia have developed a framework for tracking key priority projects at the ministerial level. The sectors covered under this ‘Joint Understanding and Intention on Possible Plans and Priority Investment Projects for Enhancing Indo-Russian Economic and Investment Cooperation’ include automobile, industrial and road-building machinery, chemical and petrochemical industry, civil aircraft construction, fertilizers, pharmaceuticals, energy, diamonds, IT, automobiles, and agro and processed foods. While discussing cooperation in the petrochemical industry, both sides expressed satisfaction over the progress made by plant construction unit for manufacturing butyl rubber with capacity of 100,000 tonnes per year at the production site of Reliance Industries (RIL) in Jamnagar. The plant is being constructed under a joint venture formed by Russian petrochemical company SIBUR holding and Indian RIL. Both sides expressed the hope that plant, the biggest in India and one of the biggest in the world, will start its operation by 2015 as scheduled. The two sides also agreed for collaboration of joint development and manufacturing of civilian aircraft and helicopters for especially for emergency relief and medical purposes. Under the collaboration, it is planned that they will not only be used for domestic purposes, but also possibilities to export them to third countries will be explored. One of the projects under collaboration for civilian aircraft and helicopters envisages the setting up the joint venture for manufacturing in Indian factories different modifications of light helicopters Ka-226T for medical, rescue and other purposes. The Russian side has mooted a new proposal involving IL-112V. Indentifying the biotechnology and nanotechnology as emerging areas for collaboration, Sharma also stressed the need to leverage India’s expertise in IT sector. Both the sides were of the firm opinion that in mining and metallurgy sector, there has been a long-standing partnership between India and Russia in the steel sector which has provided excellent results over time. However, they felt that there is still considerable scope of cooperation in modernization of steel manufacturing facilities. Russians also conveyed to Sharma that Russian companies in power sector were keen to participate in modernization of old power plants and heavy engineering units based in India. Sharma also informed the Russian side about the recent liberalization in FDI regime in India. He said that liberalization in defence manufacturing and telecom will create new opportunities for Indo-Russian joint ventures in the areas. “The Russian side welcomed the measures taken by the Indian government. However, they stressed a need to maintain regulatory certainty and stability in the policy regime,” the statement said. Sharma asked the Russian government to urgently address the concerns and resolve the problems of Indian pharmaceutical companies, seeking to set up manufacturing bases for low-priced drugs in Russia. Ahead of the St Petersburg Forum, Sharma held talks with Rogozin and Russian Industry and Trade Minister Denis Manturov, with pharmaceutical products high on the agenda. During his talks with their Russian counterparts, he sought to simplify on urgent basis the regulatory procedures for the supply of generic medicines by India to Russia in order to enable the Indian manufacturers to smoothly access the country’s generic drug markets, an official statement said. “As Indian pharmaceutical companies are keen to establish manufacturing bases in Russia, it is imperative that Russian government should address their concerns in an expeditious manner,” Sharma said. Sharma has reiterated during talks with Russia on many occasions that India was ready to invest in pharmaceutical plants in Russia. In this connection, Russia’s Pharma 2020 programme to develop domestic production base, have attracted many Indian pharmaceutical companies to explore the possibilities of joint ventures with Russian companies. According to one estimate, India has a petty share of 3 percent of the total $12 billion drugs that Russia imports. India and Russia are currently in the process of liberalizing registration of new drugs in order to boost bilateral trade in the pharma sector. Currently, the process of registration of drugs, in Russia, is not only time-consuming, but also involves large sum of money. The two countries are soon to sign a deal to speed up the registration of Indian drugs in Russia, which will fast-track Indian drugs to market in Russia and also boost Indian pharma companies' investment in Russian infrastructure. Indian companies are also planning to set up testing facilities and infrastructure in Russia to get bigger market share in that country. The Indian side also emphasized on the access of wider market in Russia for bovine meet and egg-powder to boost the bilateral annual trade turnover which the two countries have fixed $20 billion as a target to be achieved by 2015. India also pointed out that as Russia’s Federal Service for Veterinary and Phytosanitary Surveillance (FSVPS) has already lifted a temporary ban on import of basmati rice and peanuts from India to Russia from September, it should also speed up the measures to start the Russian import of bovine meat and egg-powder from India with immediate effect. “Russian FSVPS may expedite their favourable recommendation so that export of bovine meat and egg-powder could begin immediately from India,” Sharma said. According to the statement, the Russian side assured Sharma that the matter will be reviewed in October and expressed the hope to find a satisfactory solution.